As Iran deal critics warned, Tehran continues to up its support for terrorism with sanctions relief money. Move seen as snub to Hamas. 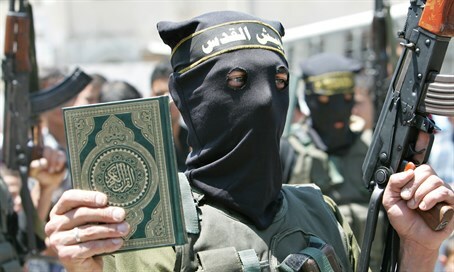 Iran has agreed a new support package to the Palestinian Islamic Jihad terrorist group, pledging to provide $70 million in annual assistance to terror group's "jihad" against the State of Israel. Sources close to Islamic Jihad told the pan-Arab Asharq al-Awsat newspaper of the pledge, which came after a visit by PIJ leaders to Tehran in April for meetings with the head of the Iranian Revolutionary Guards Qods Force, Qassem Soleimani. That delegation was headed by Islamic Jihad's Secretary General Ramadan Shalah, along with two of his top aides Akram Ajuri and Ziad Nakhleh. Soleimani's Qods Force is in charge of international terrorism, espionage and proxy wars on behalf of the Islamic regime. The previously shadowy leader gained a high profile for leading pro-regime operations in Iraq and Syria against Sunni insurgents - operations which often included public appearances on the frontlines. The meetings followed two years of strained relations between the Islamist terror group and Tehran, and essentially represented an emergency bailout as the cash-strapped group had been struggling to pay some of its personnel for several months. It will also be seen as a serious snub towards Hamas, Islamic Jihad's main rivals in the Gaza Strip, which has over the past months in particular shifted away from Iran towards Tehran's arch-nemesis Saudi Arabia. Once a key Iranian proxy, Hamas fell out of favor with the Islamic Republic after refusing to openly back the Assad regime at the outbreak of the Syrian civil war in 2011. Years of stuttering relations from then deteriorated completely after a senior Hamas delegation visited Saudi Arabia in 2015, in what Tehran perceived as a slap in the face. The Syrian civil war - which has split the country and the wider Arab and Muslim worlds along sectarian lines - pits the Shia-aligned Allawite Assad regime against the Sunni opposition. As the Palestinian offshoot of the Sunni Muslim Brotherhood, Hamas found itself in an awkward position as a key Iranian patron. Shia Muslims make up only a tiny minority of the Palestinian Muslim population. Islamic Jihad is also primarily a Sunni Islamist group, but is seen as almost an Iranian surrogate. Despite that, the tensions between it and Iran were also in part a result of the terror group's fence-sitting vis-a-vis the Syrian civil war. In return for the massive aid package, Islamic Jihad will be even more closely managed by Iran. Discussions with Soleimani reportedly centered on a "restructuring" of Islamic Jihad's "military wing," the Quds Brigade. Following the deal, Shalah lavished praise on the Iranian regime, and criticized Arab states for not similarly supporting them. "Defending Palestine is defending Islam," he told an audience in Tehran, and went on to slam Sunni Muslim states for aligning with Israel over the Iranian threat. "Transformations in some Islamic countries allowed Israel to commit many crimes against the Palestinian people without being halted by any one," Shalah said. "None of the Arab countries has supported and will never support the popular uprising in Palestine due to the conflicting policies adopted by their officials in the recent years." "We have noticed that the Islamic Republic of Iran is the only country that supports the uprising and helps the martyrs’ families," he added, referring to Iran's special fund to pay families of Arabs killed carrying out terror attacks against Israel. Since securing the controversial nuclear deal with world powers - which included billions of dollars in sanctions relief - Iran has considerably upped its support of international terrorism and regional proxies, as Israeli and other critics of the deal warned would occur.